Human rights campaigners have warned the "honour killing" of a 20-year-old woman is not an unusual case in the UK. Banaz Mahmod was killed after falling in love with a man her family did not want her to marry. 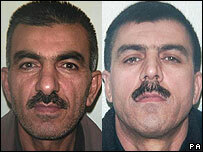 Her father Mahmod Mahmod, 52, and uncle Ari Mahmod, 50, from Mitcham, London, were convicted of murder on Monday. Human rights barrister Usha Sood said so-called "honour" crimes were becoming more common and were "being perpetrated in the hundreds every year." Miss Mahmod's father and uncle ordered the murder because they believed she had shamed the family, the three-month trial at the Old Bailey heard. Mohamad Hama, 30, of West Norwood, south London, an associate of Ari, had already pleaded guilty to the murder. The police described Miss Mahmod's murder as an "honour killing." Ms Sood, who specialises in Asian family cases, told BBC Radio Five Live "honour crimes of some sort" whether or not they resulted in death, were becoming more common in the UK. "But certainly honour crimes are being perpetrated in the hundreds every year," she said. Miss Mahmod had made several attempts to warn police her life was in danger, even naming those she thought would kill her. In mobile phone footage recorded following an earlier attempt on her life by her father in December 2005, she said she was "really scared". "There are lots of suicide cases where woman have been forced to commit suicide," she added. She said police in the UK must treat the issue "seriously and sensitively". "Banaz repeatedly went to police and she seek help but police failed to help her and she was killed," she said. "And they could help her and they could save her, actually. And there is not any unit to deal with honour killing cases." Miss Mahmod fled but later went back to her family and tried to carry on her relationship with boyfriend Rahmat Sulemani in secret. Miss Mahmod was urged to stay at a safe house but told officers she believed she would be safe at home because her mother was there. Her sister Bekhal, 22, who is in hiding from the family, condemned her relatives for taking her relative's life.